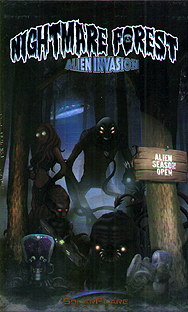 Nightmare Forest: Alien Invasion is a Cooperative game, where players must work together to cleanse the forest of Aliens before it's too late! You will deal out a grid of Forest Cards. Each turn, players will move their character(s) around the Forest and decide which Forest Cards to flip over to potentially expose Aliens, fiendish Traps, useful Gear, or valuable Allies. There are four levels of cards, with higher challenges requiring that players choose whether to hope for a lucky roll, or to combine their unique Abilities and Gear to improve their chances of defeating powerful foes. To win, you and your friends must stay alive and clear the entire forest before the last turn. If any players are killed, or if the game ends before the Forest is cleared, then the aliens overrun the City, and destroy humanity.